In Arizona, we are able to actually direct some of our state income tax obligation to qualifying charitable organizations. To people from out-of-state this seems difficult to believe. We can make a donation and reduce our state income tax by the amount we give—up to $400 for individuals or $800 for a couple filing jointly. In other words, we can donate without it costing a cent. 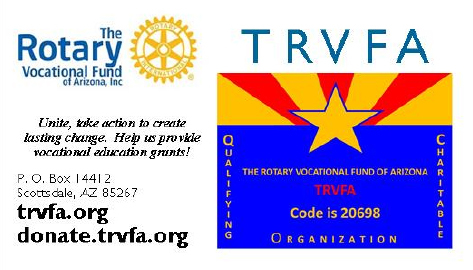 The Rotary Vocational Fund of Arizona (TRVFA) is such a qualifying charitable organization. It was founded by Rotarians and received its 501(c)(3) charitable status in 1990. TRVFA is still operated by a board of directors made up entirely of Arizona Rotarians. Vocational Service is one of the five avenues of service of Rotary International. Many clubs struggle with how to identify and fulfill good vocational service goals. Support of TRVFA not only supports the vocational service ambitions of Rotary, it also supports community service. Recipients of our vocational education grants have to qualify by meeting established low-income guidelines. The grants enable them to acquire the necessary skills and certifications to enter well-paying vocations and thus contribute to the Arizona economy. Even if you've already exhausted your tax credit donations for the year by donating to other charities, this charity is worthy of your support. We hope you will help us "Unite, take action to create lasting change. Help us provide vocational education grants."